Concerted cleaning efforts averted major disaster in Eilat, but more serious oil spills are only “a matter of time” say Israeli officials. Two separate oil spills contaminated the waters off Eilat in Israel over the weekend. The Jerusalem Post reports that the initial oil spill on Friday morning came from an unknown source, although officials suspect that a Turkish ship, which was leaking oil while docked at the Port of Eilat, may be the culprit. 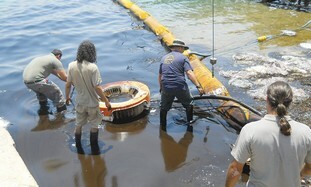 Friday’s oil spill was discovered in the area between Tur-Yam Marina, bordering the protected coral reserve. Saturday’s leak was discovered in the port. A cleanup operation was dispatched immediately. Using special equipment, workers from teh Marine Pollution Prevention Station and the Nature ande Parks Authority, with help from Eilat Field School volunteers, managed to clean up both spills relatively quickly. 5 Tons of light fuel oil and 20 barrels of oil were recovered from the Friday spill, and an additional 5 tons of oil were cleaned up in the Port. Although disaster was averted this time, the Chairman of the Knesset’s Environment and Health committee, Dov Henin, worries that further hindrances to updating the archaic 1952 Petroleum Law will eventually result in more serious incidents. Thanks Maurice. The ocean was once a vast, unimaginable space. But we have conquered it. And that’s not a good thing. Spills like this and of course the disastrous one in the Gulf of Mexico last year only make the situation of the world’s oceans worse and lead to what could one be a complete breakdown of the oceans marine ecosystem.